Am back in Cebu, about to go on holiday to visit some friends and family in Oz. Crashed out at 9pm last night, and slept for 11 hours solid without moving, woke up in exactly the same position. 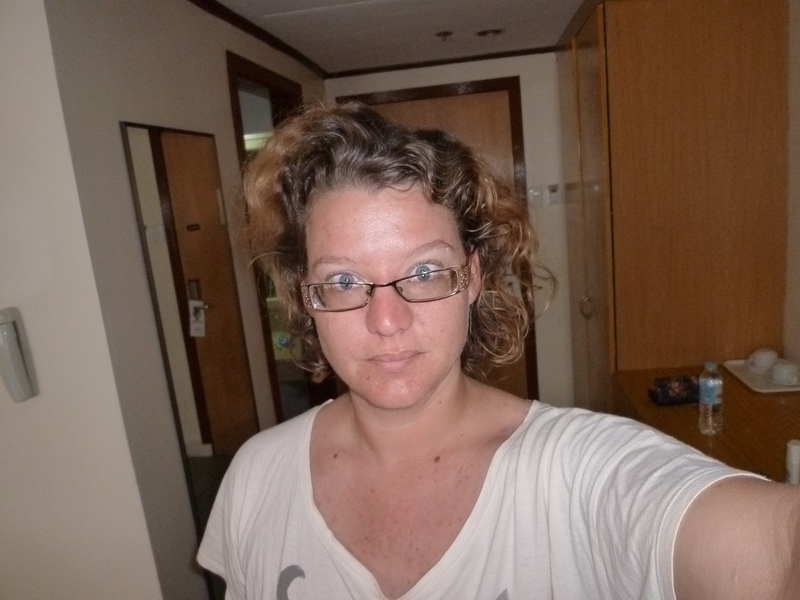 Here’s what happened to my hair while I was sleeping though…. 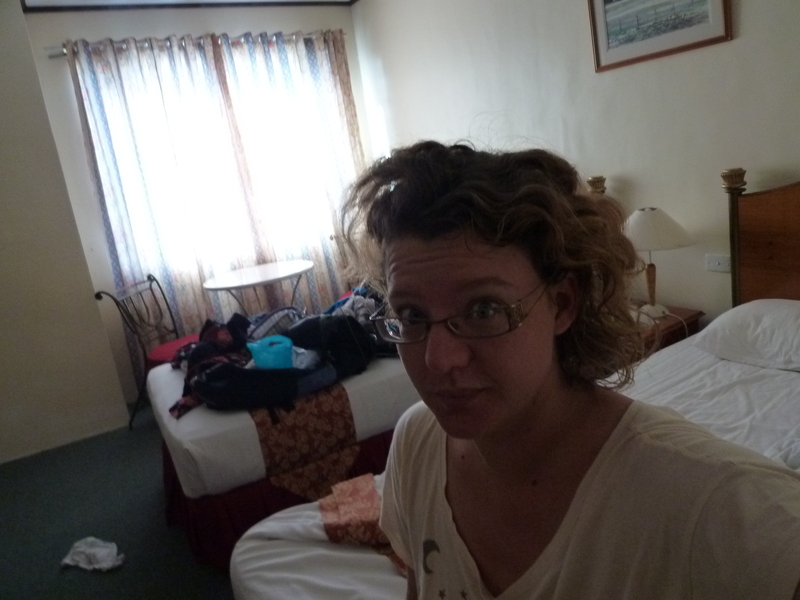 I’m not impressed with the direction my hair seems to be taking – so far it’s mostly vertical…. Well, so much going on around here! I’m still pretty tired and grumpy at the moment, so not much has changed there. Life in the UN hub is interesting…. There are thankfully a very small number of you out there who know precisely how grumpy I can be when I’m tired. Lack of sleep does not make me a chirpy, happy bunny, and I have been known to just grunt at people when very tired, especially when I’m not yet fully awake in the morning. So it is a great shame that since coming back to Eastern Samar, I have slept very badly every night for a wide variety of frustrating reasons, which is slowly wearing me down and making me feel grumpier and grumpier…. The last time I was here for the EMMA, there was a tropical depression passing through, so it was very wet and windy, but lovely and cool. My colleague and I both slept well, although the mosquitos were out in full force, and I had to put up my mozzie net over the bed. However this time round, when I returned for 2 and a half more weeks to support some cash programming, it’s hot as hell, and very, very humid and sticky. Well I wouldn’t be me if I didn’t have plenty of ridiculous comedy moments while attempting to go about my business and appear somewhat professional along the way…. You can read the highlights of my comedy moments here, but since then there have been a few additional things that I thought you might all appreciate! A couple of weeks ago I went to a meeting at the Department of Agriculture, where they were bringing in all 40 of the Municipal Agricultural Officers for a big meeting on rice seeds, fertilisers and discussing recovery plans for farmers. So there I am sitting at the table surrounded by important people, rooting around in my bag for a pen, and out flies a tampon and lands pointedly in the middle of the table. Rather awkward. Towards the end of January I went to Eastern Samar for a week to help support (and get trained on) an EMMA. For those of you who are wondering, EMMA is not a woman, it is an Emergency Market Mapping and Analysis tool (you can find out more about the toolkit on the EMMA website). With an EMMA, you select one critical commodity that you want to learn more about (could be soap, rice, wheat flour, chickens, taxis, etc) and map out the market chain, looking at supply chains, end users, and all of the other factors that influence that product getting from the manufacturer to the consumer. Well, since the Great Rice Seed Race, (which Anneka Rice has so kindly helped me to document), I had a nice week of R n’ R over xmas and New Year. Christmas day was nice, if uneventful. I went out with a few colleagues to have a nice lunch somewhere, but most places were closed, so we ate at the mall. I found it weird how many people chose to spend Christmas day at the mall, but who am I to judge? That’s when things started to go downhill rather fast! Boxing day was fairly hungover and quiet.